I was fortunate to attend an interview with the author, Gail Saltz, M.D. as she discussed her new book The Power of Different at the MJCCA Book Festival in Atlanta. 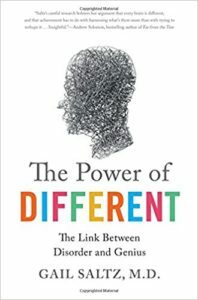 In it, she describes how all kinds of brain “problems” associated with learning and mental differences are actually the source of great strengths. She cited many examples including that of Author David Sedaris, who attributes his perfectionism and discipline to his anxiety. This has been instrumental in his writing success. Albert Einstein had Attention Deficit Disorder, and according to the author, his hyper-focus allowed him to produce his 3 most important papers in only 3 weeks! I thought about how Introverts are often challenged by being seen as different. This is particularly true in extrovert dominant workplaces or with leaders who are extroverts and not aware of introversion. There is nothing wrong with introversion. It is simply how someone is wired. The stigma that a person with autism, a learning disability or attention deficit disorder faces is not unlike what introverts report experiencing. Many introverts tell me that before they were aware of introversion as natural and normal they had internalized judgmental thinking from others and thought something was wrong with them. When they don’t speak up or take longer to respond than others in the room, they are called “slow.” Yet, the depth of thinking introverts exhibit is exactly BECAUSE they took their time to think. When introverts are quiet in a meeting of extroverts they are seen as having nothing to contribute. Yet they are processing their thoughts. When encouraged to speak, their comments reveal that they have been listening deeply. The often cogent, high-quality responses of introverts reflect that. For people with some kind of learning or psychological difference, early childhood experiences of struggle can greatly impact self-esteem. For introverts, negatively labeled shy in school or being graded down for not speaking up in class can take years to overcome. The positive news is that the tide is turning with what I call the “rise of the introverts.” As introversion has slipped into the public discourse, introverts are owning their strengths and others are starting to think about them more positively. Another positive development is how we perceive negative judgments as we age. There is a phenomenon called neuroplasticity which says the brain is like plastic and can form new neural pathways. This allows us to change our thinking about how we see ourselves in addition to changing our behavior. As we all learn to reframe what society has deemed “weaknesses” and appreciate our strengths we can step into our full potential and allow others to do the same. This entry was posted in Uncategorized on November 8, 2017 by Jennifer Kahnweiler.